Not everyone appreciates the tarantula personality, but these arachnids can be quite entertaining and even somewhat affectionate. When a tarantula is not feeling well, it can be hard to know what's bothering him. It's important to know your pet well so you can tell when he's not himself. Dehydration is a serious condition for tarantulas. Some tarantulas don't drink the water provided by their caregivers, giving caregivers the impression they don't need it. Since most tarantula species are desert creatures, it's a common misconception that they don't need much water. It's true that wild tarantulas get most of their water from their prey, but there are times when they need to drink -- and when they do, they need to do it immediately. Dehydration presents with symptoms you can clearly see: He's lethargic and appears to be shriveled or shrunken, and his body may appear wrinkled. The treatment for dehydration is water. Provide clean water in a shallow dish wide enough for your tarantula to crawl on but not so deep he could drown. He will lower himself into the dish and drink in the water he needs. Tarantulas can live a long time without food but will die without hydration, so be sure to keep your little friend well hydrated. Tarantulas are fragile during molting, or ecdysis. If he's not well hydrated, his body will be dry and cause problems as he attempts to exit his old exoskeleton. Molting problems occur in malnourished or elderly spiders, the very young and those with previous molting problems that left deformed appendages. Premature molting causes problems as the carapace splits too soon. Some spiders will build a molting pad out of silk prior to molting, and their reduce activity. If you see signs your spider is about to molt, remove uneaten prey, as even small crickets can injure a spider during molting. If you suspect your tarantula is having trouble with his molt, treatment involves adding moisture to your spider's body so he can try to ease herself out of his exoskeleton. You can use a tweezers to remove any damaged or broken legs, or a wet paintbrush to lubricate his body and try to ease the spider out of the old exoskeleton. A good thing can be bad when, in your quest to keep your pet's habitat humid and moist, you overdo it. When mold takes over, it can cause your tarantula fatal internal organ infections. The infection will present itself as a cream-colored, uneven spot on your tarantula's carapace, abdomen or tips of the legs. Treatment involves moving the spider to freshly cleaned and well-ventilated housing and applying betadine to the affected area. Prevention is important, however, because once the mold or fungal infection is large enough to be noticed, it's usually too late. Immersing the spider in a solution of 10 percent alcohol may help, but that's a last-chance treatment when a spider is dying. Some spider species require a lot of humidity since they come from swamps instead of deserts, so it's important to know exactly what kind of spider you have. They all have unique needs. Burrowing species are especially at risk since they hide for long periods of time. Since science has yet to invent a topical treatment for parasites that affect tarantulas, such as those for dogs and cats, parasites are a problem. Nematodes, internal parasites, render tarantulas unable to eat and makes them very sick. Symptoms of nematode invasion include unusual activity such as restlessness or spinning lots of silk, refusal to leave the water dish or eat his prey, a sickly sweet odor in the habitat, and a white, gummy mass of goo near his mouth. There is no treatment as of 2012, but researchers at the Research Institute for Exotic Species Microbiology were working on it. Mites can be a problem if you are not careful about humidity and moisture in your tarantula's housing. There are no actual symptoms, but you will see them around your spider's mouth. Treatment is as easy as removing them by coating a cotton swab with a little petroleum jelly and touching mites with the swab. They will stick to the swab. Though not an ailment, injuries are common among tarantulas as they can break their legs if they fall while trying to scale a glass wall of an aquarium or if roughly handled. While appendages can and do grow back, in most cases of trauma, the spider will die. Treatment can be rendered with surgical glue, but even if you do manage to save the leg, it will cause molting problems which will, in turn, kill the spider eventually. The savvy tarantula-keeper will adhere to all the requirements recommended by giant spider experts to be sure to avoid injury and illness rather than try to deal with the consequences. Do Tarantulas Have Natural Enemies? 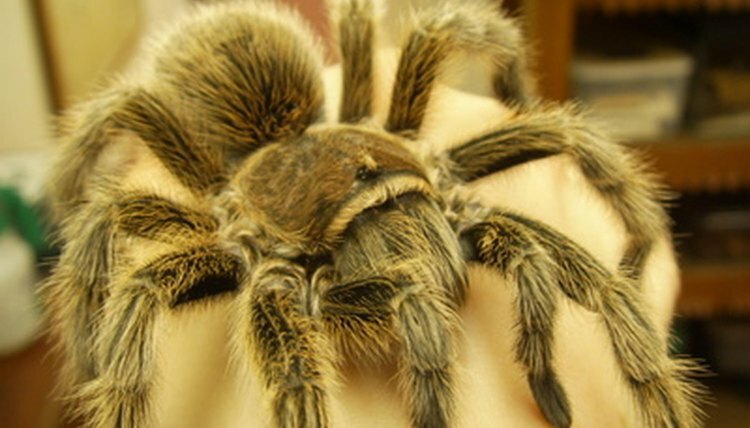 What Happens if a Leg Comes Off a Tarantula?